Aren't people funny about Felixstowe? I know visitors who claim to love Suffolk, and come east as often as they can. They have a special affection for Aldeburgh, or Southwold, or Framlingham, or some other tourist hotspot. But they treat Felixstowe with disdain, and I know many people like that who have never even visited it. None of them live in Ipswich, of course, because Felixstowe is Ipswich-by-the-sea, and the hamlet of Felixstowe Ferry is a peaceful, secret outpost that everyone in Ipswich knows about. You head north of Old Felixstowe, the sea dramatic beneath you, Bawdsey Manor and its pine woods ahead, probably the most dramatic coastal view in all East Anglia. If travelling by car and feeling lazy, you pass Felixstowe Ferry golf course, as unattractive as all golf courses are, but it is the setting for M.R. James' famous ghost story Oh Whistle, And I'll Come To You, My Lad. If you want a better route, however, you pull into the car park before the golf course, and walk the undemanding mile or so along the coastal path past two grand Martello towers, before arriving in this remote and delightful little spot. There used to be two good pubs here, but the Victoria is now closed. The other is the Ferry Boat Inn, which I remember fondly from before its unfortunate modernisation. However, The Ferry Café is a Suffolk institution, famous for its substantial and cheap breakfasts, and (whisper it if you dare) the more recently opened Winkles Café down by the pier is just as good, especially for fish and chips. There are also a couple of seafood shops, and even a gallery, in this little place that cannot be home to more than thirty people. Famously, you can take the passenger ferry from here across to Bawdsey, and many Ipswich children will tell you that they come here to 'go crabbing' - but most people will respond with surprise if you tell them that there is a church here as well. 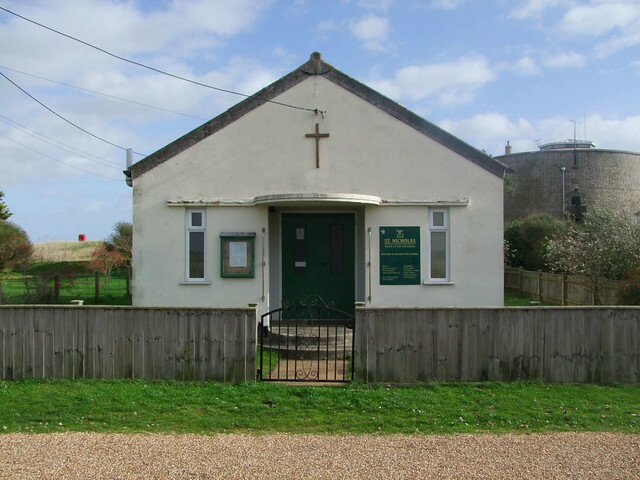 St Nicholas was originally built in 1870, a mission outstation to the medieval parish church of Old Felixstowe, St Peter and St Paul, about a mile and a half to the south. At the time, the mother church was undergoing a major restoration, and perhaps this was part of the same funding project. I've no reason to think that this was an any less sparsely populated and remote spot in those days, so the establishment of a chapel of ease probably reflects the Anglican enthusiasm of those heady days more than any conceivable need. It was intended to serve as a school, as well as a church. On and off, it did so as both, until one night in 1943, when a stray bomb wrecked the little building. 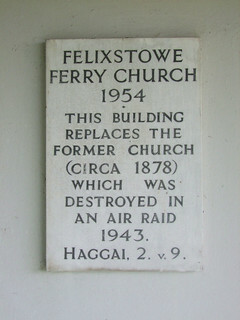 Felixstowe Ferry was always vulnerable to these attacks, often by German pilots heading back from raids in the Midlands with undropped bombs. Bawdsey Manor, half a mile away across the estuary mouth, was a top secret RAF research establishment. It was there that radar was developed. The whole of this coast came under special measures during the War, with only essential personnel allowed into it. The current St Nicholas was erected in 1954. It is about as functional as it is possible for a building to be, and you probably wouldn't recognise it as a church without the notice at the west door. It is set in a neatly clipped lawn with flowerbeds, and a garden gate from the path that leads down to it from the road. All in all, it is perfectly fitting, a typically English seaside stab at domesticity in this wild and remote place. And be in no doubt that Suffolk is wild here. Stand at that gate, and look out, and the marshes spread beyond you, punctuated here and there by clumps of gorse. This spot is carved from nature, and nature might easily claim it back. It is already doing so to the east, where the Deben estuary cuts a little further westwards every year, carrying away hundreds of tons of shingle and dumping them offshore, creating an island that did not exist when I first came here 30 years ago. There, at the river mouth, there are two colours, light grey and dark grey. Sea, sky and shingle alternately take them on, and the sense of a shifting, impermanent landscape is tangible. 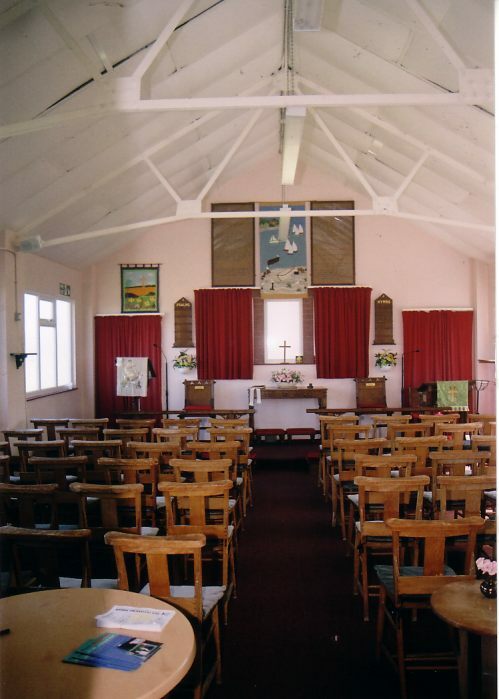 I only know what this church is like inside from photographs, and Peter Stephens has kindly lent his for you to see below. I've always found it locked, and the frosted windows allow no view of the interior. If this was a Catholic church, we would place a statue inside, call it a shrine, and it would receive thousands of visitors every year. However, this is the Church of England, and it must cut its clothes to suit its cloth. 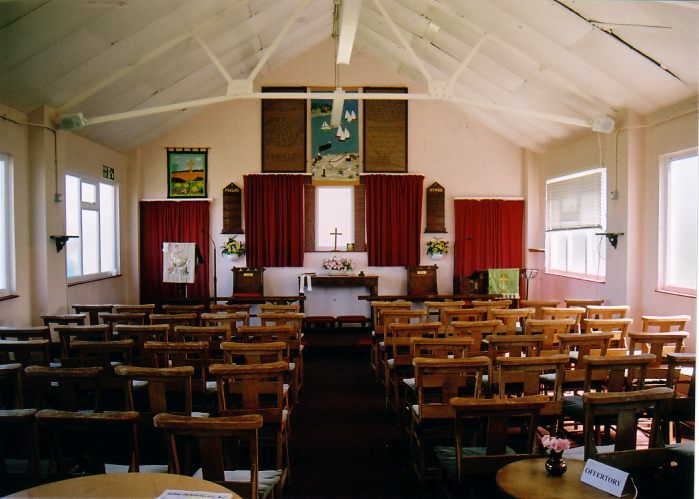 So, this little church has been threatened with redundancy, and even fell into disuse for a while. But, as is the way at present, Anglicans with their backs to the wall seem more prepared to come out and fight, and this church is now a significant part of the benefice that includes St Andrew and St Peter and St Paul. 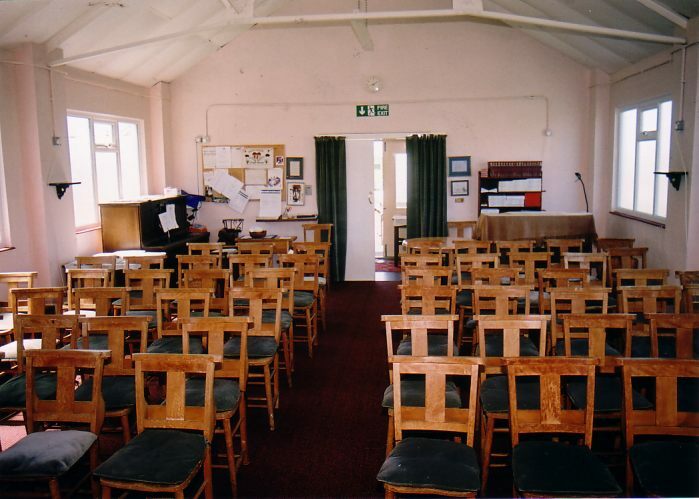 They are committed to regular services, and this church is back in regular use - at least, until the Deben reaches it. On the second Sunday in July each year, as St. Nicholas is the patron saint of sailors, they hold a Sea Sunday service in the afternoon. Worth stopping for if you can. And then travel on, ever northwards. Stand at the ferry pier, and look across to Bawdsey, with its pine woods and foreign houses looking full of possibilities. So, take the ferry across, because it is an adventure waiting to happen. The photographs below were taken by Peter Stephens and retain his copyright.